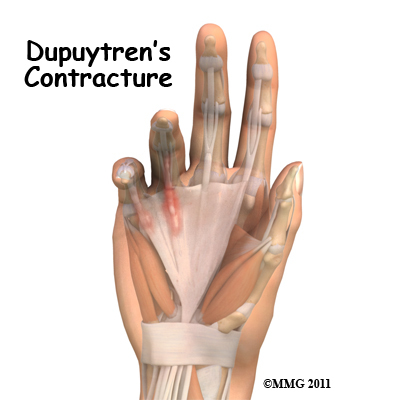 Welcome to Advantage Physiotherapy's resource about Dupuytren's Contracture. Dupuytren's contracture is a fairly common disorder of the fingers. It most often affects the ring or little finger, sometimes both, and often in both hands. Although the exact cause is unknown, it occurs most often in middle-aged, white men and is genetic in nature, meaning it runs in families. This condition is seven times more common in men than women. It is more common in men of Scandinavian, Irish, or Eastern European ancestry. Interestingly, the spread of the disease seems to follow the same pattern as the spread of Viking culture in ancient times. The disorder may occur suddenly but more commonly progresses slowly over a period of years. The disease usually doesn't cause symptoms until after the age of 40. What part of the hand is affected? The palm side of the hand contains many nerves, tendons, muscles, ligaments, and bones. This combination allows us to move the hand in many ways. The bones give our hand structure and form joints. Bones are attached to other bones by ligaments. Muscles allow us to bend and straighten our joints. Muscles are attached to bones by tendons. Nerves stimulate the muscles to bend and straighten. Blood vessels carry needed oxygen, nutrients, and fuel to the muscles to allow them to work normally and heal when injured. Tendons and ligaments are connective tissue. Another type of connective tissue, called fascia, surrounds and separates the tendons and muscles of the hand. Lying just under the skin of the palm is the palmar fascia; a thin sheet of connective tissue shaped somewhat like a triangle. 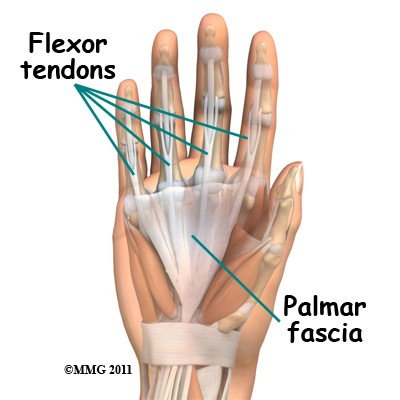 This fascia covers the tendons of the palm of the hand and holds them in place. It also prevents the fingers from bending too far backward when pressure is placed against them. The fascia separates into thin bands of tissue at the fingers. These bands continue into the fingers where they wrap around the joints and bones. Dupuytren's contracture forms when the palmar fascia tightens, causing the fingers to bend. The condition often first shows up as a thick nodule (knob) or a short cord in the palm of the hand, just below the ring finger. More nodules form, and the tissues thicken and shorten until the finger cannot be fully straightened. Dupuytren's contracture usually affects only the ring and little finger. 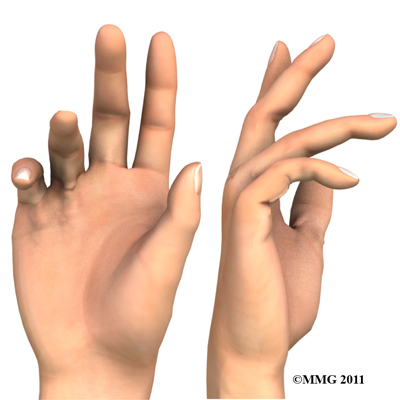 The contracture spreads to the joints of the finger, which can become permanently immobilized. No one knows exactly what causes Dupuytren's contracture. The condition is rare in young people but becomes more common with age. When it appears at an early age, it usually progresses rapidly and is often very severe. The condition tends to progress more quickly in men than in women. People who smoke have a greater risk of having Dupuytren's contracture. Heavy smokers who abuse alcohol are even more at risk. Recently, scientists have found a connection with the disease among people who have diabetes. It has not been determined whether or not work tasks can put a person at risk or speed the progression of the disease. 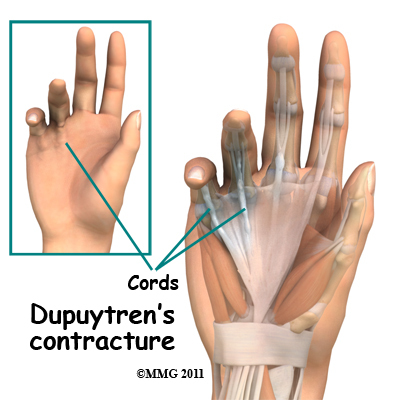 What does Dupuytren's contracture feel like? Normally, we are able to control when we bend our fingers and how much. How much we flex our fingers determines how small an object we can hold and how tightly we can hold it. This control is lost as the disorder develops and the palmar fascia contracts, or tightens. The contracture is like extra scar tissue just under the skin. As the disorder progresses, the bending of the finger becomes more and more severe, which limits the motion of the finger. Without treatment, the contracture can become so severe that you cannot straighten your finger, and eventually you may not be able to use your hand effectively. Being that our fingers are slightly bent when our hand is relaxed, many people put up with the contracture for a long time. Patients with this condition usually eventually seek medical advice for cosmetic reasons or because they lose use of their hand. At times, the nodules can be very painful. For this reason many patients are worried that something serious is wrong with their hand. How do health care providers identify the problem? When you visit Advantage Physiotherapy, our physiotherapist will ask you the history of your problem, such as how long you have had it, whether you've noticed it getting worse, and whether it has kept you from doing your daily activities. We will then examine your hand and fingers. Our physiotherapist can tell if you have a Dupuytren's contracture by looking at and feeling the palm of your hand and your fingers. Usually, special tests are unnecessary. Abnormal fascia will feel thick. Cords and small nodules in the fascia may be felt as small knots or thick bands under the skin. These nodules usually form first in the palm of the hand. As the disorder progresses, nodules form along the finger. These nodules can be felt through the skin, and patients can usually feel them themselves. Depending on the stage of the disorder, your finger may have started to contract, or bend. The amount you are able to bend your finger is called flexion. The amount you are able to straighten the finger is called extension. Both are measured in degrees. Normally, the fingers will straighten out completely. This is considered zero degrees of flexion (no contracture). As the contracture causes your finger to bend more and more, you will lose the ability to completely straighten out the affected finger. The loss of ability to straighten out your finger is also measured in degrees. Measurements we take at follow-up visits to Advantage Physiotherapy will tell us how well our treatments are working or how fast the disorder is progressing. The progression of the disorder is unpredictable. Some patients have no problems for years, and then suddenly nodules will begin to grow and their finger will begin to contract. Our physiotherapist may also do the tabletop test. The tabletop test will show if you can flatten your palm and fingers on a flat surface. You can follow the progression of the disorder by doing the tabletop test yourself. Our physiotherapist will tell you what to look for and when you should return for a follow-up visit. Advantage Physiotherapy provides services for physiotherapy in Kleinburg. There are two types of treatment for Dupuytren's contracture: nonsurgical and surgical. The best course of treatment is determined by how far the contractures have advanced. The nodules of Dupuytren's contracture are almost always limited to the hand. If you receive regular examinations, you will know when to proceed with the next treatment step. Dupuytren's contracture is a progressive disease, early treatment, determined by the stage of the disease, is important to release the contracture and to prevent disability in your hand. Treatment is determined based on the severity of the contracture. Ongoing research of this condition has resulted in a less invasive nonsurgical method of treatment called an enzymatic fasciotomy. If it is the main knuckle of the finger (at the base of the finger) that is contracted, and there are only one or two cords involved, this procedure may be possible. For this treatment, a new injectable drug, Xiaflex, which is gaining popularity and approval for use around the world, is used. By injecting an enzyme directly into the cords formed by the disease, the tissue dissolves and starts to weaken, most often the patients are able to break apart the cord by themselves. With the injection of this new drug generally patients return within 24 hours for a recheck. If the cord hasn't broken apart, your physician may have to numb the finger and then stretch it to break apart the cord and regain full motion of the finger. This technique sounds dramatic, but it's not! The treatment so far has been deemed to be safe and effective. There are a few possible (minor) side effects but very few major or long-term complications with this new treatment. During the control trials conducted with patients, most people had a local skin reaction (redness, skin tears, itching or stinging) where the injection went into the skin. A small number of more serious problems developed in a few patients including tendon rupture, finger deformity, and hives that had to be treated with medication. Further studies are needed to assess the long-term effects of this new treatment, especially to determine any recurrence rates. Injection of this drug may eventually replace surgery. Until then, surgical release of the cords and removing a portion of the fascia will likely remain the gold standard. The ability of nonsurgical treatments to slow or actually reverse the contracture is not all that promising. The contracture usually requires surgery at some point. In the early stages of this disorder, frequent examination and follow-up is recommended. In addition to your physiotherapy treatments at Advantage Physiotherapy, your doctor may want to inject cortisone into the painful nodules. Cortisone can be effective at temporarily easing pain and inflammation. Heat and stretching treatments given by our physiotherapist may also be done to control pain and to try to slow the progression of the contracture. Our physiotherapist may advise you to wear a splint that keeps the finger straight. This splint is usually worn at night. The combination of heat, stretching, and a finger splint seem to be the most effective non-surgical treatments for Dupuytren's contracture. attend our physiotherapy sessions a few visits per week for up to six weeks. After that, our physiotherapist will instruct you to continue using the splint and do the stretches as part of a home program for several months. The nodules of Dupuytren's contracture are almost always limited to the hand. If you attend physiotherapy regularly and follow our physiotherapist’s advice, you may be able to slow the problems caused by this disorder. Dupuytren's contracture, however, is known to progress, so surgery may be needed at some point to release the contracture and to prevent disability in your hand. No hard and fast rule exists as to when surgery is needed. Surgery is usually recommended when the joint at the knuckle of the finger reaches 30 degrees of flexion. When patients have severe problems and require surgery at a younger age, the problem often comes back later in life. When the problem comes back or causes severe contractures, surgeons may decide to fuse the individual finger joints together. In the worst case, amputation of the finger may be needed if the contracture restricts the nerves or blood supply to the finger. Surgery for the main knuckle of the finger (at the base of the finger) has better long-term results than when the joint in the middle of the finger is affected. A contracture is more likely to return after surgery for the middle joint. The goal of tissue release surgery is to release the fibrous attachments between the palmar fascia and the tissues around it, thereby releasing the contracture. Once released, finger movement should be restored to normal. If the problem is not severe, it may be possible to free the contracture simply by cutting the cord under the skin. If the palmar fascia is more involved and more than one finger is bent, your surgeon may take out a large portion of the sheet of fascia. This remains the gold standard of treatment for Dupuytren's contracture. Removal of the diseased palmar fascia will usually give a very good result. The cure is often permanent but depends a great deal on the success of doing the physiotherapy post surgically as prescribed. Removing the palmar fascia causes little ill effect, although the fingers may bend backward slightly more than normal. If you decide to have this surgery, it is pertinent that you commit to doing the therapy needed to make your surgery as successful as possible. 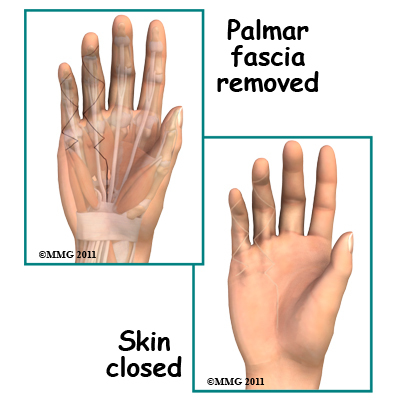 Removal of the entire palmar fascia (radical fasciectomy) requires extensive removal of involved and non-involved palmar and digital (finger) fascia. This approach may be required but it has higher complications rates without providing better success rates so it is no longer done commonly. A less invasive procedure called a needle aponeurotomy (also referred to as a percutaneous fasciotomy) is available when the disease is at an early stage. 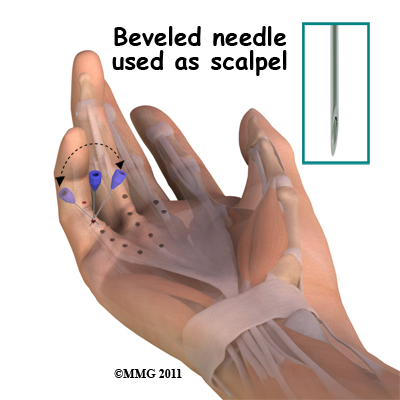 Under local anesthesia, the surgeon inserts a very thin needle under the skin. The sharp needle cuts a path through the cord, weakening it enough to stretch and extend it, or rupture it. The advantage of this procedure is that it can be done on older adults who have other health issues that might make surgery under general anesthesia too risky. The disadvantage is a high recurrence rate and the potential for nerve injury, infection, and hematoma (pocket of blood) formation.This procedure, however, has replaced the fasciectomy in many practices. A skin graft may be needed if the skin surface has contracted so much that the fingercannot relax as it should and the palm cannot be stretched out flat. Surgeons graft skin from the wrist, elbow, or groin. The skin is grafted into the area near the incision to give the finger extra mobility for movement. Your hand will be bandaged with a well-padded dressing and a splint for support after surgery. As stated above, your physiotherapy at Advantage Physiotherapy is a very important part of your recovery. Physiotherapy treatments after surgery can make the difference to a successful result. The treatments applied by our physiotherapist may include a program of heat, soft tissue massage, and vigorous stretching, as well as a home program which includes similar exercises that you will be required to do on your own. Your physiotherapist will keep a close watch on how your recovery is going, and will take ongoing measurements to mark the progress of your recovery. Generally physiotherapy at Advantage Physiotherapy occurs without any issues, and full recovery occurs provided our advice is closely followed. If, however, your recovery is not progressing as your physiotherapist feels it should, we will ask you to return to your surgeon for a follow-up visit to ensure there are no complications, which are impeding your recovery. When your recovery is well under way, regular visits to Advantage Physiotherapy will end. Although we will continue to be a resource, you will eventually be solely in charge of doing your own exercises as part of an ongoing home program.